Bloodborne is the latest (new) release from From Software, the developers behind the infamous Souls series. This may well clue you into several truths about the game. Firstly, you’re going to die and it won’t always feel earned. Secondly, nothing is explained. And thirdly, the camera controls are flaky at best. While Bloodborne is in many ways indistinguishable from the Souls games (Blood Echoes are very much Souls masquerading under a different moniker), its world and tone really sets it apart. Bloodborne is not simply morbid; it’s malignant in its entirety. At first glance Bloodborne is easily identified as an action-role-playing game, set in a world filled with voracious werewolves and ghoulish beastmen. While this holds true for a time, it is not representative of the whole experience, for below the surface of Bloodborne – below the skin of Yharnam – lies far more peregrine horrors. Secretly, Bloodborne is a terrific survival horror game, which manipulates the fear centres of one’s brain with gleeful abandon. As you inch through a yet to be explored street, clouded in a cloying mist, the dread builds, the tension mounts. Release may come as an ice spike of terror, induced by a jump-scare from an un-illuminated alcove, or it may release in the form of a perfectly typical bout of combat. That sees your knuckles whitening yet further, slowing your next action, your next reaction, until finally the diseased talons of whatever creature assaulted you, wrenches the last desperate gasp of life from your Hunter. For me, Bloodborne’s single greatest quality is the sense of discovery it imparts so naturally, throughout just about all facets of the game. It comes in the form of the combat, for example; the game is obtuse, it won’t tell you how to approach a situation, a new enemy, or area. It won’t explain your characters stats; I still don’t know what ‘Bloodtinge’ truly means, but it appears to be a requirement for ranged weapons. I also don’t know why I can summon bullets at the cost of part of my health, it just happened, because naturally, Bloodborne offers no guidance on any of its systems. For the most part, dissecting the gameplay is a fun, or at least rewarding process, made somewhat smoother by the notes, the messages that other players can leave throughout the world. Sometimes its poetry, other times its genuine help. 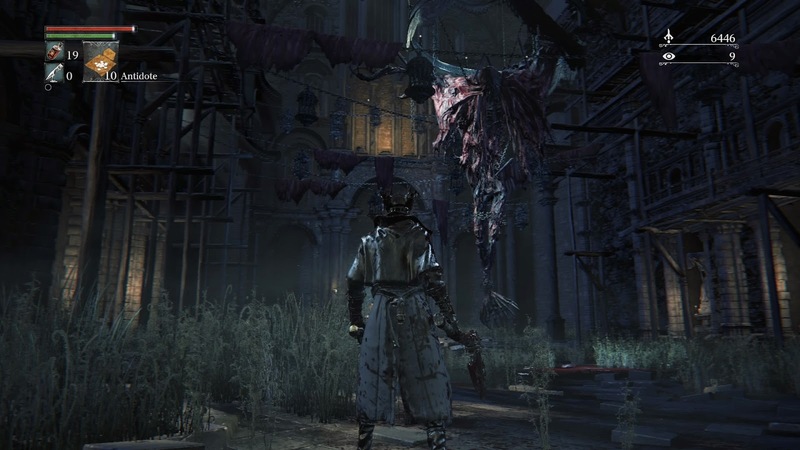 Yharnam is the true harbinger of discoveries however, the level design, aside from being oppressively thick with atmosphere, loops and flows around itself, connecting areas and shortcuts in an astounding way. I was constantly torn between an often fatal desire to investigate every alleyway, and the fear of what may be lurking within. There are plenty of items to be found throughout the world, and the coveted unique weapons and armour can’t be discerned from handful of pebbles. Though, even pebbles have their place in the arsenal of a Hunter. When I describe the weapons, and armour as unique I am referring more to their use rather than scarcity; most weapons, once prerequisites are fulfilled, can be purchase in the Hunter’s Dream (your one and only safe haven). Additionally, items major and minor are a huge source of lore, a precious, though obscured commodity that I found well worth seeking out – admittedly, most of my own understanding came later from online discussions. There are main and off-hand weapons, the main hand weapons can be transformed between two versions, frequently this means a slower, perhaps two-handed variant, and a faster single-handed mode. However, the weapons can vary wildly and learning to wield a new one is, in my experience, a time and health consuming affair. The combat is dependent on the smallest factors; a fraction of a second longer animation, or a few inches less range, could spell disaster to your expedition. 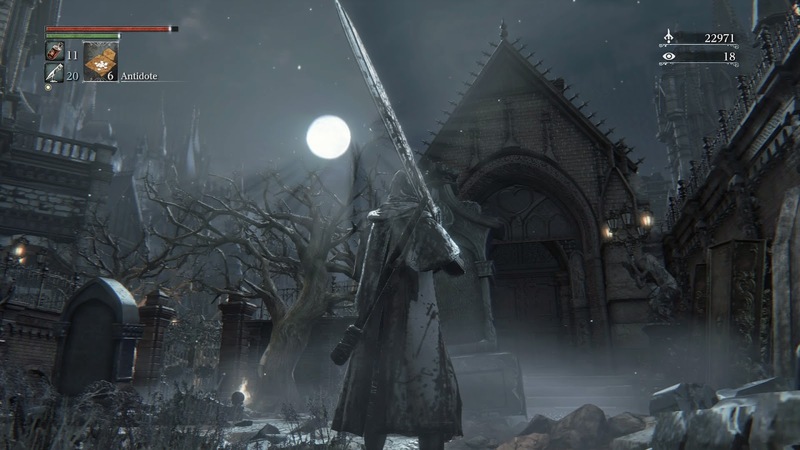 Bloodborne doesn’t reward patience and attention, it downright demands it. Bloodborne is clearly something special, yet more often than not, I prematurely ended my play sessions, ejected the disc and fabricated whatever excuse I could to put off picking it back up. It is one of the many reasons this review is so late. It’s not that it is impossibly difficult - it’s really not, I wouldn’t have finished it if it were. Rather, my issues stem from the opening hours, which are virtually impenetrable, as well as the last few zones, where the game forgets its place, and turns to cheap tricks and unsatisfying bosses. It took me more than six hours to break out of the first area. Laugh if you will, for I am well aware others have blasted through it in a fraction of the time, I also know other people have had a far rougher time than I. There is no learning curve, what’s worse is there’s no progression either, real or perceived. Levelling, the one thing that could at least make you feel as if you’ve achieved something after a three hour massacre, is locked until you acquire a point of Insight. Gained by encountering the first boss, for example, and it obviously doesn’t explain any of this to you at all. Which is fine; discovery is rewarding, it’s what makes the whole game work at all. However, the opening area sees you pitted against literally mobs of enemies, who are all subtly different in their speed and range. Even at the end of the game, where it recycles tougher versions of many of these enemies, I still found them more difficult than most of the larger, more threatening creatures who appear in more manageable circumstances. I found the first boss, the Cleric beast to be a veritable cakewalk compared to the two werewolves who stood together before it. It’s not ‘hard-core’, it doesn’t even feel challenging really, just frustrating. The game really gives the impression that it wants you to think its insurmountable right of the bat, and such an aim should lead to a hugely rewarding pay off when you finally overcome it. However, the reality is it’s a poorly structured opening area that really doesn’t accurately represent the bulk of the game. Bloodborne is at times quite forgiving; you can grind, for and carry with you, more healing items than is usually necessary, for example. Although, enemies usually kill you so quickly there isn’t much chance to use them, which is where levelling comes in. Now let’s remember this was locked and unavailable for my first six hours with the game, and levelling your character isn’t necessary but is extremely useful. How you level your character is less important than you might think, so long as you are complementing your choice of weapon, you are either improving your survivability, of increasing you damage output. Two factors that would have really been useful to even the odds early on, and more importantly, provide a reason for grinding your way up the same street for hours. The importance of dodging, learning your weapon’s capabilities, and so on, has to be tested thoroughly, yes. However, if the most prevalent emotion I have after six hours with a game is seething anger, and beating the first boss is a relief rather than a joy, then yes, I think it is profoundly flawed. These are not feelings I had consistently; the middle twenty or so hours is fair; challenging but not cheap. Deep within the Pthumerian layers. The Chalice Dungeons address some of my grievances with the game’s structure, and while certainly more visually repetitive and constrained, they still manage to capture the meaningful sense of exploration and the brooding malevolence. 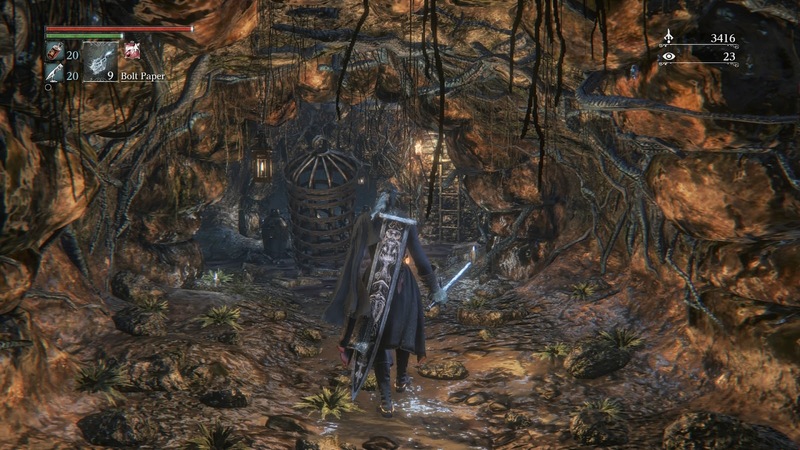 Chalice Dungeons are multi-layered dungeons, filled with all manner of ancient horrors and indiscriminate traps. Each layer has a boss guarding the path to the next layer, the boss itself is always close to the lamp you respawn at, but it’s behind a locked gate, the gate’s switch hidden somewhere on that layer. Each layer is its own area to explore, with optional paths and treasures to uncover. The Chalice Dungeons factor into the lore and history of Yharnam, and retain much of the core Bloodborne experience only in microcosm. They are also great places to stumble into exotic enemy types that don’t appear in the main world, or you might not have encountered yet. Some dungeons are predetermined, while others are generated based upon the materials used in the ritual, they can also be shared with other players. That the lamp on each layer is but a few steps from the boss, is a true game-changer. It may seem like a minor point but its impact is astronomical. 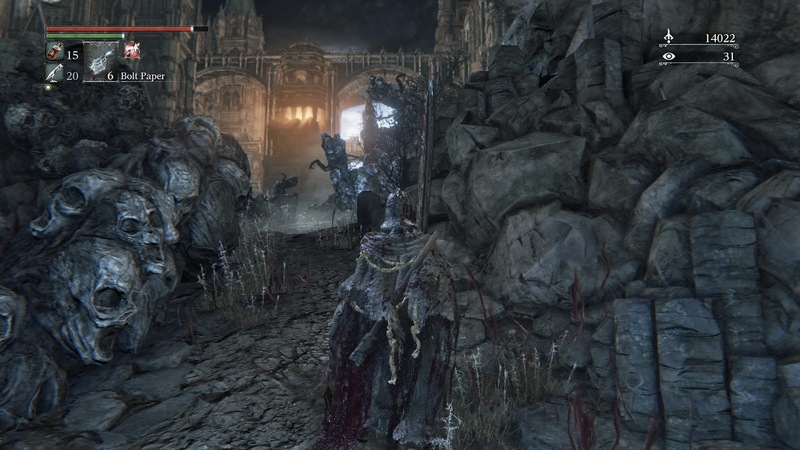 I could die to a Chalice boss ten times and still not be as agitated as dying two or three times to a regular boss. There’s still the long load (these have since been reduced in a patch) of course, but that’s nothing when compared to the usual trek the game forces you to make. In the main world, these runs are sometimes several minutes of traversal through unlocked shortcuts, often without any threats, that genuinely add nothing to the experience. As if to further rub salt in wound, the game, which resets enemies each time you die, can’t even be so decent as to reset the elevators, so you have to call and wait for them too. As mentioned previously the player messages are present, so too are spectres; a ghost of a player’s final moments, which I never found useful, unlike the messages. You can invade other people’s worlds, though with the exception of a few areas, you opt into the experience. You can offer to join other players, or request people join you, to help even the odds. While having more than one player trivialises the boss fights for the most part, it is a magical experience. I had more fun, more satisfaction engaging with the multiplayer than I did lone wolfing any other part of the game. I can completely understand the stance that going completely solo is the only experience a player might want, that’s fine, but it’s not a view I harbour. I helped multiple players through boss fights and each time was as rewarding as the first – and a hell of a lot more rewarding than my own, solo victories. Having players help me was liberating, it alleviated the frustration and sometimes even revealed new ways of play, or weaknesses I didn’t know I could exploit. Perhaps the most memorable and intense experience I had with the game was as a result of a multiplayer invasion, in which I was the invader. In the closing areas of the game players can invade without consent; I was annoyed because even without that factor, these areas are populated with cheap enemies and even cheaper mechanics. So I decided that if I was going to suffer this badly, I was going to drag someone else down with me. Lying in wait, in a shadowed alcove, I sprung upon my prey. They (I couldn’t ascertain gender) were already engaged with a trio of magic-wielding warriors, somehow they survived and ran for their life. This resulted in an intense fight lasting over ten minutes, which saw us both exhaust our supplies of Bloodvials and bullets – as well as ourselves. It was exhilarating, ten minutes of parry, retreat, dodge, and attack as I blocked the player’s progress to the final (mandatory) boss of the game – a fight I found far less satisfying. For me that fight was the single best slice of Bloodborne, I can only hope that the player, whoever they were, is able to regard that epic confrontation in the same light and not remember me for the terrible, progress-halting frustration that I had first sought to be. Bloodborne’s dispiriting atmosphere is the result of a deftly mixed concoction that sees tense gameplay, chilling sound design, and macabre visuals denature into a uniquely odious ambience. 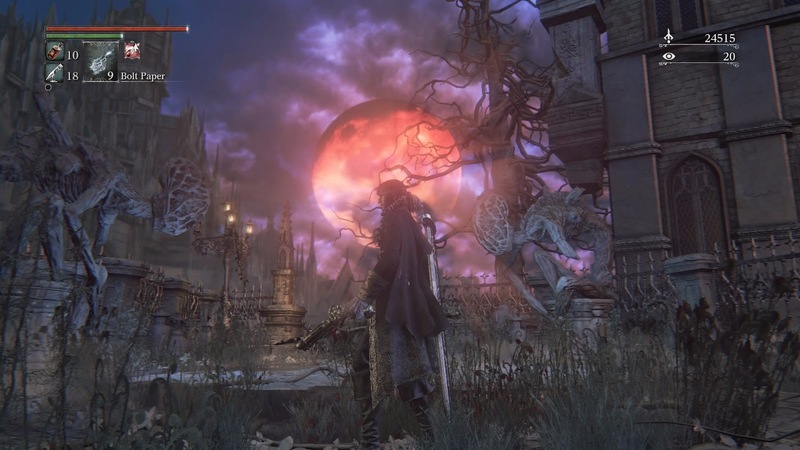 From a more technical angle, Bloodborne is a little less impressive, but it is supported by some decent effects; fire, mist, and lighting, in a broader application. Lighting is consistently well demonstrated as the world’s sky and moon undergoes its ethereal shift throughout the course of the game. However, some of the textures are rough – and are easy to stumble upon thanks to the game’s erratic camera controls – but the details, the items that really demand your attention, are sharp. Character models and clothing look great and there is an alarmingly deep character creator, which is odd considering that most of the game’s headwear obscures your character’s face. Clothing, bodies, and environmental details all feel the effects of a suitably volatile physics engine. All too often this caused me to recoil in shock, as the body of a slain monster would get caught on a bench and contort itself in a manner that would not look out of place in a Bloodborne animation. Some enemies, including bosses like the Blood-Starved Beast, elongate their limbs in some truly abhorrent ways. The Beast also demonstrated the physics particularly well; as it was cloaked in what I suspect was a covering of bloody skin, that hung and swung realistically. Although, the aberrant form of Vicar Amelia – a very large werewolf is perhaps a more impressive technical feat. 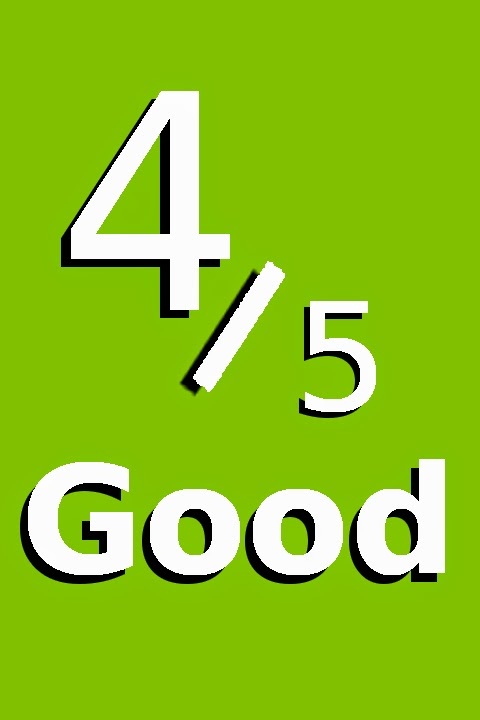 The game is afflicted by fickle framerate however; some areas and bosses are consistent offenders. What I consider to be the game’s strongest visual effect, which I’m sure some will harbour distaste for, is the prominent use of chromatic aberration. This effect splits the colours; red, green, and blue, along the outer edges of just about everything on the screen. Creating a coloured distortion, a blur effect reminiscent of older lenses, which I feel really works in the game’s favour. The world of Bloodborne is a sick and rotten one, the kind without a shred of joy, where any semblance of humanity has been scoured clean, or perhaps more accurately, grown warped and awry. The way the game conveys and builds this world is spectacular, it is intense and foreboding and the sense of discovery I have moving through a new area, hell even a room, or street, is astonishing. Yet, when I think about picking up the controller to play once more, I am reminded of the shear frustration that the game can so readily arouse. I believe the way the opening area is structured and presented is an inexcusable mistake, and that the main game is worse off for not streamlining how bosses are retried. Which is clearly an issue someone felt important because the Chalice Dungeons address exactly that. The experiences I felt the strongest were only possible through the game’s multiplayer component, beating bosses solo seldom produced anything other than relief; and being thankful I never have to play part of the game again is not a positive sign. Bloodborne is a uniquely twisted game, one I wish I could enjoy playing more than I do.